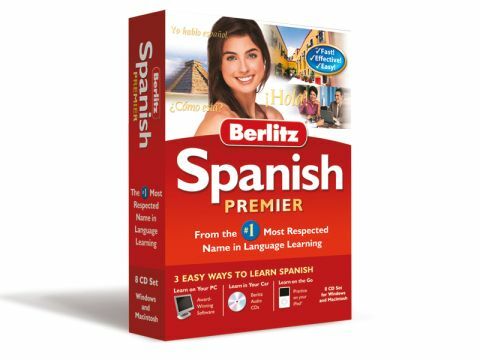 Berlitz Spanish Premier is a great introduction to learning Spanish and provides all you need to get started. The main application – Berlitz Learning System – is split into five different categories – Familiarisation, Vocabulary, Pronunciation, Conversation and Grammar. The software uses what Berlitz refers to as Immersion Environment, which aims to get the student accustomed to what the language really sounds like, through interaction and typical conversations. The conversations can be split into small sections and, using your laptop's speakers and microphone, it's possible to play back any of the individual words verbally. It's also easy to record yourself and play it back to see exactly how close you are when it comes to pronunciation. When it comes to conversations, there are Word Diction and Sentence Diction exercises to make sure you're getting everything right. With audio analysis, it's possible to see exactly how close you are to speaking the language properly. By working through all of these sections, the idea is that you'll pick up grammar subconsciously, but it's also possible to go back to a Reading tab to check out the language in writing. The software really comes into its own with activities that let you unscramble words and sentences. A feature called 'Before You Know It Flash Cards' offers a less formal way of learning, with a vast number of animated cards providing phrases and useful words. You can also choose from a host of different situations – from a restaurant, to asking for directions or beverages. All of the cards also offer verbal playback and it's also easy to print the cards. Berlitz provides several audio CDs, along with software and exercises for Pocket PCs, Palm handhelds and Apple's iPod, making this a great solution for all types of user. Overall, Berlitz Spanish Premier offers a great introduction to Spanish, with a huge array of different tools, quizzes and exercises to keep you interested.